fun alternative to any basic light bulb,maintaining a life span of up to 3000 hours. Nowadays,Edison antique bulb widely used in bars,hotels,karaoke. 【Dimmable and Comfortable Light】①You can adjust the brightness of the light as needed. 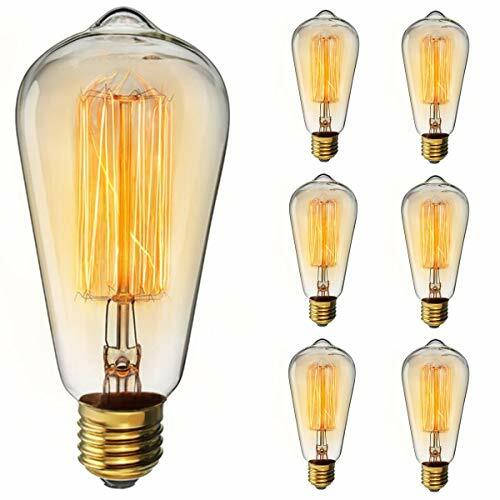 Dimmable vintage Edison bulbs provided a much brighter and more useful light (dimmer switch NOT included).②The bulb giving off a warm light, creating you homey and comfortable ambiance. Add an elegant, historic touch to your house with these antique bulbs. 【Upgrade Package Design】Add Cushioning Foam and Blister to make sure the bulbs are well protected during transit. CE and ROHS Certification, we're always here to help you with your order of brilliant products. 【Unique Design】The shaped Amber glass is exactly like a traditional Edison Teardrop and fits regular light fittings. Nostalgic reproduction, reach to 265 lumens, E27 or E26 base 60W 110v 2200K Dimmable and amber glass. 【Where to use it】Anywhere! E26/E27 bulb base which means they fit standard home lighting sockets as well as most pendant light fixtures like wall sconces, commercial string lights, ceiling fan lamps etc. Typically used for home or commercial decoration. Kitchen, living room, bedroom, bar, coffee shop, restaurant.